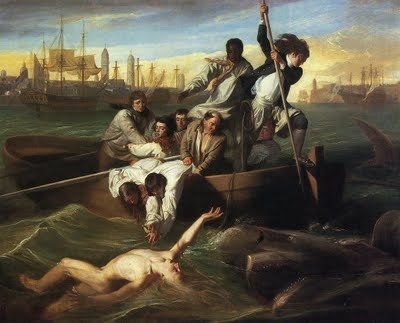 John Singleton Copley, "Watson and the Shark"
A. FORM: In a painting, the basic structure is composed of color, light, line, and texture. Color: Cool colors suggest rest and calm (blues, greens, purples). Warm colors suggest agitation and emotion (reds, yellows, oranges). 1. Describe the ways in which the artist uses color. Light: The presence of light tends to suggest openness, honesty, and/or tranquility. Light tends to create the feeling that all is well. The absence of light, in the form of darkness and shadows, tends to suggest mystery, fear, and sometimes danger. 2. Describe the ways in which the artist uses light and shadow. Lines: Vertical lines suggest strength. Horizontal lines suggest rest. Diagonal lines suggest motion and energy. 3. Describe the ways in which the artist uses lines in this painting. Subject: Most realistic paintings have a recognizable subject, such as a landscape, a person or groups of people, and/or an event like a battle. 4. What appears to be the subject of this painting? Setting: The time and place suggested in the painting. 5. Describe the place in the painting. 7. What time of day is it? 8. What year or historical period is it? 9. Who are the people in the painting? What are they doing? How are the people dressed? Describe details of clothing and/or jewelry that stand out. 10. If there are many people in the painting, describe the most dramatic facial expressions. 11. Describe the “body language,” the position of the bodies, the gestures, etc. Arrangment: People in a painting can be close together or separated. They can look relaxed and natural or stiff and formal, or caught in the middle of some great action. 12. How are the people in the painting arranged? Symbols: A symbol is any object that stands for something greater than itself. For example, a serpent may be a symbol for evil, a lily a symbol for purity. 13. Are there objects in the painting that may be symbols of the painting’s theme? Mood and Tone: The emotional impact of the work of art is of central importance. How the artist feels about the subject, and wants us to feel, is expressed through the elements of form and composition. 14. What is the mood of this painting? What is the artist’s attitude toward his/her subject? Themes and Ideas: Like writers, artists question their world and explore issues of profound importance – life, death, power, justice, suffering, hope. 15. What issues and ideas are of concern to this artist in this painting? What questions does it raise? Click here for a user-friendly handout of the guide to Viewing a Painting.